Ousted Kyrgyz president Kurmanbek Bakiyev has left the country for neighbouring Kazakhstan to meet with the country’s President Nursultan Nazarbayev. There are also unconfirmed reports that he has resigned. Earlier, Bakiyev said that he had been invited by Nazarbayev to hold talks on how to resolve the current deadlock in Kyrgyzstan. The ousted president also added that Nursultan Nazarbayev had “personally invited” him to move to Kazakhstan. 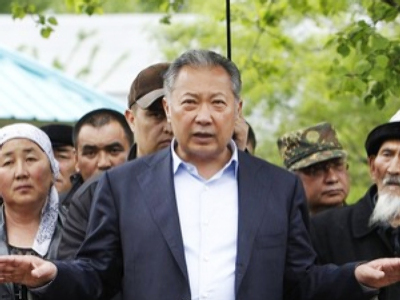 Earlier in the day, Bakiyev held brief talks with a representative of the interim government, which wants him to be either put on trial or sent out of the country. It was the first contact between Bakiyev and representatives of the opposition, though no direct talks with the interim government itself have so far been held. “It is a matter of principle that we are not holding direct negotiations and are not going to,” said the interim government's chief of staff Edil Baisalov. Bakiyev has compared the interim government to “bandits” and accused them of disturbing the rally he attended in the southern Kyrgyz city of Osh, which is seen as the country’s southern capital. In the beginning of April, rallies started in the northwestern part of the country and spread to other regions, including the capital Bishkek. As a result of the unrests, over 80 people died and more than 1500 were injured. After the bloody unrest, President Bakiyev had to flee to the south, where most of his supporters are. However, according to Sariyev, the majority of the southern regions does not support Bakiyev and are ready to collaborate with the new authorities. To arrest or not to arrest? Meanwhile, the interim government said that they are not planning to arrest the ousted president. “In line with the law, we have no right to detain or arrest him,” the interim government's Chief of Staff Edil Baisalov told Interfax on Thursday. “He has personal immunity and freedom of movement around the country,” Baisalov said. 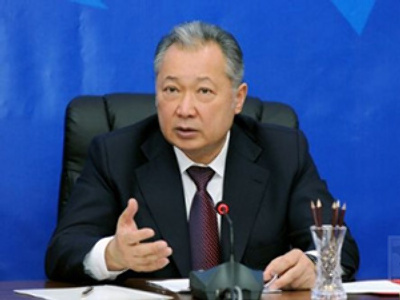 The recent statement of the interim government, however, contradicts their earlier ones, where they announced that Bakiyev has been stripped of his immunity and they want to put the ousted president on trial. The interim government’s Chief of Staff also stressed that the authorities are taking steps to arrest some people close to Bakiyev. “The matter involves his brother and other people from his entourage, whom our justice system wants to be turned in,” Baisalov said. Earlier this week, the interim government issued warrants of arrest for some of Bakiyev’s close relatives and some of the high-ranking officials, accusing them of mass murder and of passing the order to open fire at demonstrators. Russia’s Prime Minister Vladimir Putin has held a telephone conversation with the ousted President Bakiyev, and met with interim Deputy Prime Minister Almazbek Atambayev in Moscow according to the Russian government’s press service, which also said that it was Bakiyev who called Putin. However, the press service did not give any details regarding either the content of the telephone conversation with the ousted president, or of Putin’s meeting with Atambayev. Last week, Putin had already spoken with the interim government head Rosa Otunbayeva and pledged humanitarian aid to the republic. “This may sound unpopular but I will say frankly and sincerely: it was a coup, an unconstitutional overthrow. This should not happen,” said Lukashenko during a working trip to Belarus’ Gomel region on Wednesday. “One should not compare the current events [in Kyrgyzstan] with what happened in the days of [former Kyrgyz President] Askar Akayev when Kurmanbek Bakiyev came to power as a result of the Tulip Revolution. There was no shooting of people then, in the first place, and in the second place, Akayev stepped down while the incumbent president is not giving up his post. And God forbid the opposition jail or, even worse, shoot the incumbent president. That will end badly,” warned Lukashenko. Responding to the opposition accusing Bakiyev of corruption, Lukashenko supported Bakiyev’s economic policies, saying that the latter tried to “rush around begging for loans”, adding also that he knows where Bakiyev had invested the received funds: “He is building a hydroelectric power plant."